Scarce early map of the world. A fine 1633 example of Jodocus Hondius and Jean Le Clerc's scarce separately published map of the world. Based on Gerard Mercator's map of 1587, Jodocus Hondius was commissioned by the French publisher Le Clerc to produce this map in 1602. The map exists in three known states, this being the last and rarest, identifiable by the inclusion of the 1633 date as well as evidence (1620 - 21) of the broken plate in the upper left corner. Unlike most earlier editions, there is no known Le Clerc atlas corresponding to this date. Nonetheless, extensive Latin verso text makes it clear that this was part of an atlas - perhaps an unrecorded edition. This is an early and important map, predating many of the great discoveries that would follow in the subsequent decades. Consequently it is rife with speculation and bears up to extensive study. Our survey of the map will begin in North America which remained at this time largely unexplored. Of the Hudson Bay, the Great Lakes, the Mississippi River, and the Rocky Mountains there is no trace. The St. Lawrence River is, however, clearly discernible. The legendary speculative kingdoms of Quiviara, Anian, Tolm, Cibola appear in the American west. In the northeast another legendary kingdom of gold Norombega, appears roughly where Maine is today. A large inland lake or bay opening into the northern Arctic is identified as Mare Dulce (Sweet Sea) and corresponds to Mercator's Lake Conibas. 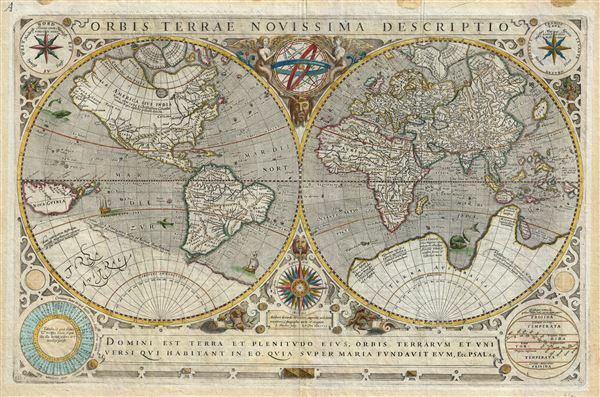 Conibas was first speculated in 1595 on Mercator's map of the northern Polar Regions, though his sources for this mysterious lake are unknown. Here the lake has been moved further south, to a position somewhat proximal to the Great Lakes, leading us to speculate that Mercator had some inkling of the Great Lakes long before their documented discovery. Nova Albion is identified in the northwestern part of America confirming English claims to the region associated with the circumnavigation of Sir Francis Drake. Mountains cross the continent in a roughly cross formation meeting around modern day Colorado, but erroneously running primarily east and west, negating any notion of the Great Plains. The Appalachian Mountains, however, are clearly represented along the eastern seaboard. South America follows a standard model with it southernmost terminus truncated north of the Straits of Magellan. The lands to the south, modern day Tierra del Fuego, are identified as the 'Insula Regina Elisabete' (Islands of Queen Elizabeth) again referencing the circumnavigation of Drake. This is significant. Most maps of the period shows Tierra del Fuego as a solid landmass attached to Terre Australis. This choice to map it as an archipelago, long before it was official proved to be so, has political implications. Competitors to the Dutch, who dominated the Straits of Magellan, thus had an alternative route, south of the strait, to the Pacific. Several cites of note are identified including Lima, Cuzco, and San Miguel. The continent is dominated by two vast river systems, the Amazon and the Rio De La Plata / Paraguay. Chile is named and identified as the home of anthropophagi or cannibals. In contrast to most later maps there is no reference whatsoever to the kingdom of El Dorado. Africa follows a standardized form with two major river systems, the Nile and the Niger dominating the continent. The Nile here roughly follows the Ptolemaic model and extends well into southern Africa. Since this map predates most missionary work in Abyssinia, the Blue Nile is here no better mapped than the White Nile. The Niger on the other hand follows a roughly correct path eastwards but fails to make its southward bend to connect with the Bite of Biafra. The mapping here suggests that river communication through the continent may have been possible, especially between the Congo and Mozambique. This ambition would later prove impractical. Asia offers much of interest. The Black Sea is oriented to the east-west, a typical error of the period. The four great rivers of Southeast Asia, the Irrawaddy, the Dharla, the Mekong, and the Chao Phraya, are presented as originating from a single great lake in the mountains. Though not labeled as such this is the speculative lake of Chaimay. A combination of practical guesswork and misattribution of Indian mythology, Chiamay was sought after until the 19th century when it finally disappeared from most maps. Japan is mapped as a globular mass with Miaca (Mecao), clearly identified on the northern shoreline. The curious Satyrorum Insule (Satyr's Island) appears just to the north of Japan. There is no sign of Korea. Of the Great wall there is no mention. Tibet (Thibet), long before the European discovery of the mountain kingdom, curiously appears as a city in north central China. The East India islands are typically garbled. Sumatra is recognizable but Java takes on a bulbous form. Borneo has been elongated and the whole has been absorbed into the Philippine Islands, some of which are recognizable, especially Mindanao. The northern Polar Regions, which are partially visible in both hemispheres, follow the curious Mercator four island model established in 1569. When Mercator drew his historic projection he realized that the mathematics of his system make it all but impossible to render the Polar Regions. While this was not particularly problematic in terms of navigation, as no one had explored the high Arctic, Mercator was nothing if not thorough. Thus piecing together factual reports from Icelandic and Norse fishermen, Davis and Frobisher, Arthurian legends, and his own scientific theories, Mercator introduced the first polar projection as an inset on his famous wall map of the world. The concept, as elaborated in his more specific map published in 1595, postulated four Arctic Islands centered about a great maelstrom. These presumably temperate and habitable islands, he postulated, were inhabited by all sort of fantastic creatures including pygmies, amazons, and cannibals. At the time the only problem with this theory was the discovery of Nova Zembla in northern Russia. The first editions of Mercator's map simply incorporate Nova Zembla into one of the four islands, as does our example here. Later editions were forced to give way to the subsequent circumnavigation of Nova Zembla and the discovery of Spitsbergen. Apparent just beyond the mythical land of Anian, Mercator here identifies the 'Polis Magnens' or magnetic north pole, which he placed roughly in the middle of modern day Alaska in an attempt to account for magnetic variation. The southern Polar Regions are dominated by the vast apocryphal continent of Terra Australis. Terra Australis was a long speculated upon landmass supposedly situated in the southern hemisphere. The theoretical basis for the continent dates to the writings of Aristotle, who taught that the globe must be in balance - so as the Americas counterbalanced Europe and Africa, another undiscovered continent must counterbalance Asia. As more and more of the world came to be explored, cartographers began adding speculative continent to their maps. A large promontory extending northwards from Terra Australis is highly suggestive of the western coast of Australia. The lands of Maletur and Beach (from the travel account of Marco Polo) are noted along the coast. While this edition of Hondius' map post-dates the official discovery of Australia in 1606 by Dutchman Willem Janszoon, the first 1602 edition, which also included the promontory, did not. Most likely Mercator extracted information about Australia from the Dieppe Maps, which were believed to have been derived from secret now lost Portuguese maps. The recognizable form of Western Australia is far too apparent to ignore the likelihood that Europeans had been visiting Australia from at least the mid-16th century. It is noteworthy that while no major attempts have been made to update this map, part of the coast of Terra Australis in what is today the south pacific has been tentatively scratched out in an attempt to erase it from the plate - no doubt this reflects confusion associated with the navigations of Magellan, Quiros, and Mendana. A smaller island just west of the Proto-Australian promontory is identified as Java Minor. Mercator extracted the idea of Java Minor from the cosmographic speculations Marco Polo. Apparently a scribal error in Book III of Polo's travels substituted Java for Champa (Vietnam), thus located Java Minor (in fact Sumatra) well into the latitudes of Terra Australis. Attempting to rectify the inconsistencies, Mercator thus added the island of Java Minor to the proto-Australian promontory. Other elements of interest include the map's bold illustration of New Guinea situated just south of the equator in the Western Hemisphere map. New Guinea had been visited regularly by Spanish and Portuguese navigators as early as the 1560s. Nonetheless, the landmass remained poorly mapped. Here Mercator and Hondius have presented a recognizable northern coastline with known place names. The southern shores, which take on a bulbous form, as with Java, are typical speculative assessments of unknown shores. While there are many other curious islands scattered throughout the map, most associated with questionable reports from little known navigators, two stand out. Situated due east of Florida a tiny island is identified as 'Sept Citiz', but better known as Antilla. It was said that when the Moors invaded Porto in the early 8th century, the city’s seven bishops took all of their wealth and fled to sea. They landed on an island in the Atlantic called 'Antilla'. There, each of the seven bishops established a city. The island of Antilla actually appears on many early portolan charts of the Atlantic. It is typically a rectangular island, usually but not always set on a north south axis, with seven deep bays, each of which holds a magnificent city. The primary map is surrounded by various astronomical and meteorological charts and diagrams including winds charts, a lunar chart, temperature charts, and a decorative compass rose. This example of the map is exceptionally fine featuring restrained but elegant color work and gold leafing. Several sea monsters and sailing ships decorate unexplored waters. Jean Le Clerc (1560 - 1621) was a French bookseller, engraver, and publisher active in Paris during the late 16th and early 17th centuries. Le Clerc, along with Maruice Bouguereau pubslihed the 1594 Theatre Geographique du Royaume de France, was subsequently republished in several editions. Le Clerc also commissioned the Dutch cartographer Jodocus Hondius to compile a world map and several continent maps to accompany later editions of the atlas. The Theatre Geographique du Royaume de France was issued in 1620, 1621, 1622, 1626, and 1631. Most editions were published posthumously Jean Boisseau, who acquired the map plates from Le Clerc's widow. Most likely there was also an unrecorded 1633 issue. Le Clerc should not be confused with another publisher and biblical scholar of the same name active in the late 17th and early 18th centuries. Very good. Original Centerfold. Latin text on verso. Shirley, Rodney W., The Mapping of the World: Early Printed World Maps 1472-1700, 233, plate 185.